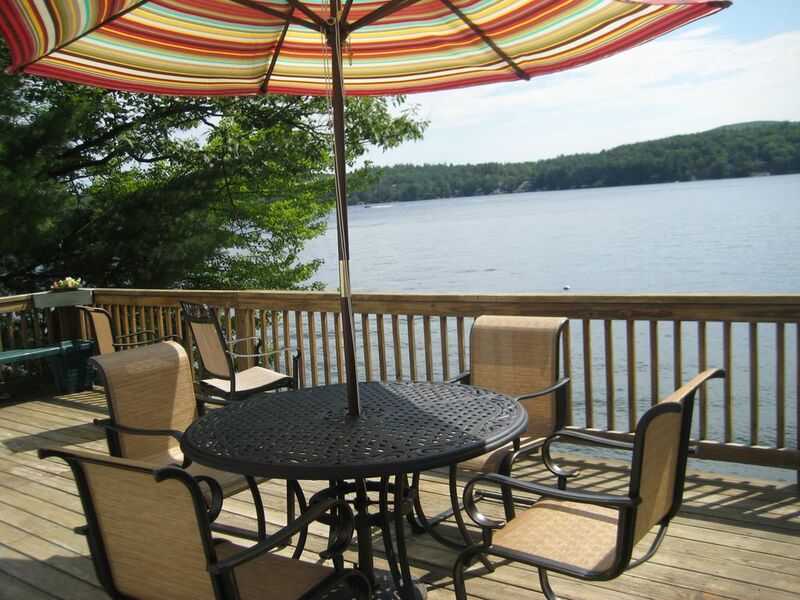 This beautiful Lake Winnipesaukee waterfront home has a large deck with spectacular views and a private dock. It is located on quiet Route 11D, a scenic road for walking and biking. It is conveniently located just a short drive from all Lake Winnipesaukee attractions. The lot is naturally landscaped with a set of stairs leading down to the waterfront and dock. Swimming is off the dock with a ladder. Parking for 4 cars is on the same level as the main floor. This waterfront home was exactly what we hoped for! We rented this home with my 3 adult children, and we had plenty of room to give everyone some space. The home was perfect, very open, airy, sunny, and you had a view of the lake from every room. Plenty to do, see, and eat 20 minutes or less away in either direction, or you could go food shopping, cook/grill, and sit by or in the water all day long and never leave the house. Yes, it was that perfect. We were very fortunate to have only 1 rainy day. This family was very nice to deal with, and we had no issues at all. We had a great week at this house, with four kids and three adults. The house is in a great, quiet location. The kids loved using the kayaks and floats, and playing off the dock. The adults loved relaxing on the porch. We all played games together in the big living room at night. House was clean upon arrival and there were no issues. The owner was helpful and easy to communicate with. We hope to go back! My family had a wonderful week at this house. The house has many large windows with skylights. The owner was very responsive to emails and made sure we had all the information we needed for a wonderful stay. I recommend that you rent a boat to enjoy the beautiful lake and its many attractions. Plenty of room for all. We would definitely come back for another week. Our family loved the house. It was so clean and felt like home immediately. We had family coming and going all week and the house was spacious and comfortable for all of our visitors. We hope to return next summer. Love it, Great place ! We stayed for a week and wish we had booked more. Great location. Great deck overlooking the water with fabulous views. We will defintily be comming back!